Book store nation, in the history of mankind there has never been a greater country than America. You could say we're the number one nation at being the best at greatness. But as perfect as America is in every single way, America is broken! And we can't exchange it because we're 236 years past the 30-day return window. Look around - we don't make anything anymore, we've mortgaged our future to China, and the Apologist-in-Chief goes on world tours just to bow before foreign leaders. Worse, the L.A. Four Seasons Hotel doesn't even have a dedicated phone button for the Spa. You have to dial an extension! Where did we lose our way?! Luckily, America Again will singlebookedly pull this country back from the brink. Covering subject's ranging from healthcare ("I shudder to think where we'd be without the wide variety of prescription drugs to treat our maladies, such as think-shuddering") to the economy ("Life is giving us lemons, and we're shipping them to the Chinese to make our lemon-flavored leadonade") to food ("Feel free to deep fry this book-it's a rich source of fiber"), Stephen gives America the dose of truth it needs to get back on track. I'm not a Colbert fan but the book was a daily deal for super cheap so I decided to give it a listen. still not a Colbert fan as his style of humor is hard to take over and over again but the book did make me laugh. As with his other book "I Am America (And So Can You! )," the guide to know whether or not you'll enjoy this is whether or not you enjoy the Colbert Report. And if you're going through withdrawals because that's not on the air anymore, this is a quick hit to normalize you. It's not nearly as funny as the other book, but I still laughed. How can you not laugh? The whole reason to get the audio is the performance. Sure, you could read it in book form (and maybe you should! ), but you'd be missing that vital Colbert-ness that makes it more entertaining than it really has a right to claim. Much like the show. His tongue in cheek opinions that represent a FOX news pundit on steroids are so laughable that even conservatives will find it amusing. In this installment he covers everything from jobs and the economy to Obamacare. The strongest bits were at the beginning but then wavered towards the end of the book. His set on food towards the end was so forgettable that I can't even remember it and I finished this book just the other day. I would have given this book higher ratings if it was longer and if the material was more timeless. This was a short book and is already a little dated. What could Stephen Colbert have done to make this a more enjoyable book for you? Add more substance. It seemed that most of this book was a rehash of stuff from his show, without presenting any new ideas. It's a very short book as it is, so fresh concepts would be appreciated. Also some of the sidebar "skits" were not at all interesting or clever and seemed especially juvenile, which made me want to fast forward through an already short book. . Probably not, but an equivalent would be to watch several episodes of the Colbert Report. Stephen Colbert is an entertaining performer, and could make almost any book enjoyable. However, the way he performed it was the best thing about the book -- the content does not really stand alone as a book. 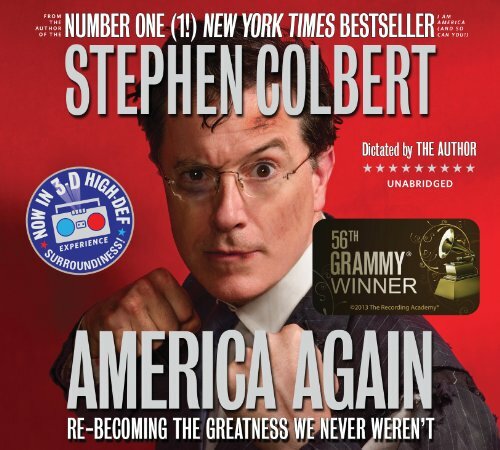 In a phrase that Colbert himself might use, this book contains too much hyperbolic hyperbole. I enjoyed his previous book, which was very entertaining and more subtle. That book kept leaving me with a question of "wait, does he really think that? Oh no, of course not." In this book, he hits you over the head with a humor hammer; he is working too hard for the laughs by making all his exaggerations huge. It is still entertaining, just not his best work. Too dramatic, which he really doesn't need to create a successful work. That was hilarious and thought provoking. So enjoyed SC reading his book, made it even better! I enjoyed the few hours of lighthearted political commentary. There wasn't really anything here to make me think. I'm not saying that sort of thing is necessary. This is a funny and intelligent book, but I don't really feel I gained anything from it. If you are in the mood for some seriously funny Colbert narratives, get this book now. The bit about chiropractics was just too funny. I highly recommend this audiobook as a comedic relief to our current culture - it will keep you entertained. Disappointing, was hoping for more from Colbert. Seems like he was trying too hard with this one. Decent listen. It's quick and entertaining. The substance won't overwhelm you. I'd listen to more like the for half the price.